Choose from best-selling fragrances like Hugo Boss Bottled and Hugo Man, or perhaps the newer Boss Orange and Boss Bottled Night are more to your taste. Whichever masculine scent you opt for, you’ll receive a free Boss Bottled Night Sports Bag, a roomy holdall that is as perfect for weekends away as it is for the gym. Throw all of your things in (including your new Hugo Boss fragrance, of course), sling it over your shoulder, and you’re away. 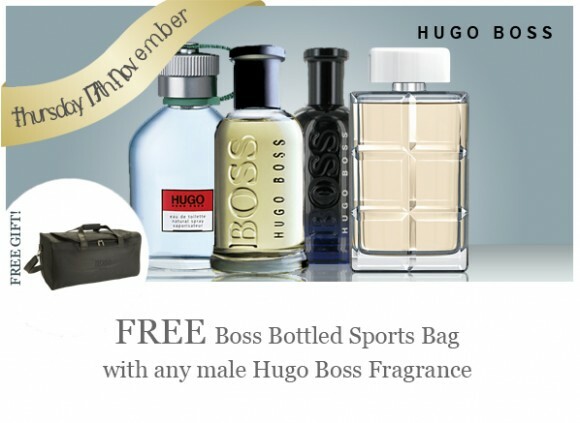 Buy any male Hugo Boss fragrance to receive your free gift! This entry was posted on Thursday, November 17th, 2011 at 8:00 am and is filed under Christmas, Gifts, Offers. You can follow any responses to this entry through the RSS 2.0 feed. You can skip to the end and leave a response. Pinging is currently not allowed.